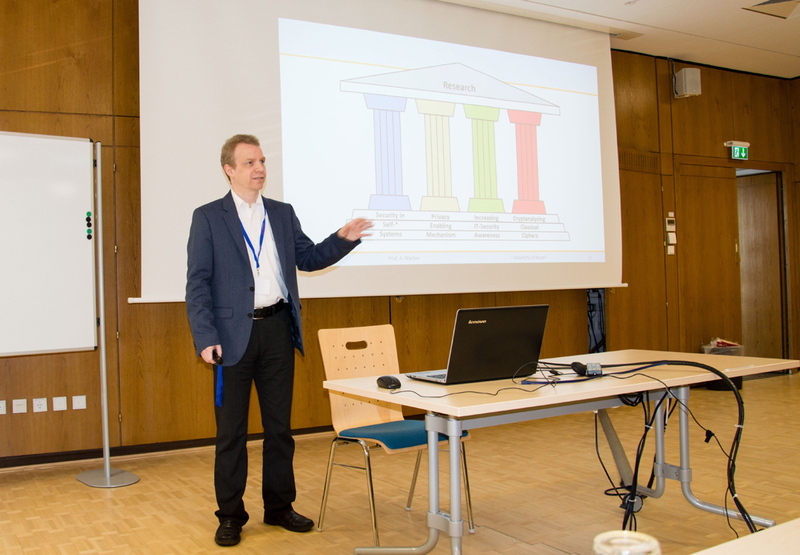 The 2nd HCC took place at the University of Kassel on May 5th 2016. We show here the description of the talks and some selected pictures of the colloquium. The flyer of the colloquium is available here. The first speaker is Mr. George Lasry. He is a computer scientist in the high-tech industry in Israel and a PhD student with the research group "Applied Information Security" (AIS) at the University of Kassel. Prior to this, he worked for many years on the development of communications systems and managed R&D and sales organizations. 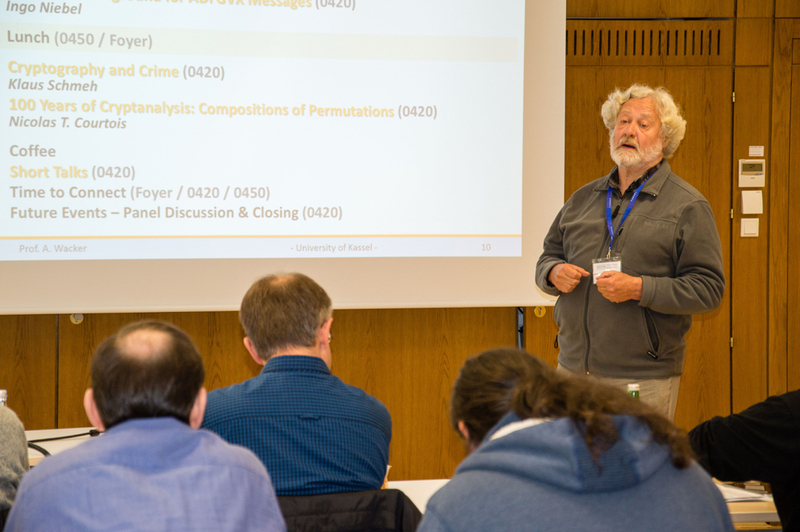 His primary interest in cryptographic research is the application of specialized optimization techniques for the computerized cryptanalysis of classical ciphers. Using such a technique, he solved in November 2013 the Double Transposition (Doppelwuerfel) cipher challenge, which was published by Klaus Schmeh in 2007. George Lasry will give a talk about the deciphering of ADFGVX messages of the "forgotten" Eastern Front of WW1. Dr. Ingo Niebel is the second speaker. He is a historian and freelance journalist living and working in Germany. 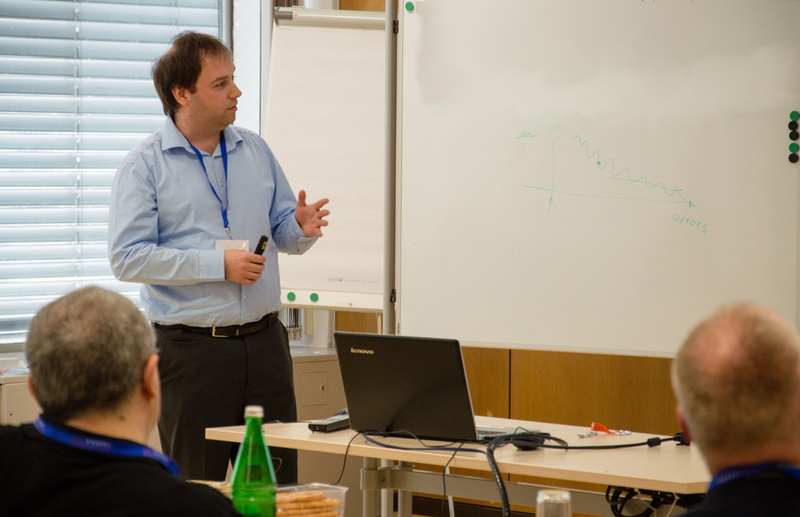 He received his PhD from the University of Cologne in 2012. Since 1996, he is also a member of Eusko Ikaskuntza, the Society of Basque Studies. He has published several books in German and Spanish about the Basque Country and intelligence during the Spanish Civil War (1936 - 1939). During his research, he uncovered Civil War original telegrams encrypted using the Spanish Strip Cipher, which could not be read, as the encryption keys had been lost. He was part of a team led by Professor Christof Paar, who has the Chair for Embedded Security at Ruhr University Bochum, Germany. The team successfully decrypted those historical messages. He, furthermore, worked together with Mr. Lasry on the ADFGVX messages. In his talk, he will give an overview of the historical content and relevance of those messages. The third speaker is Mr. Klaus Schmeh. 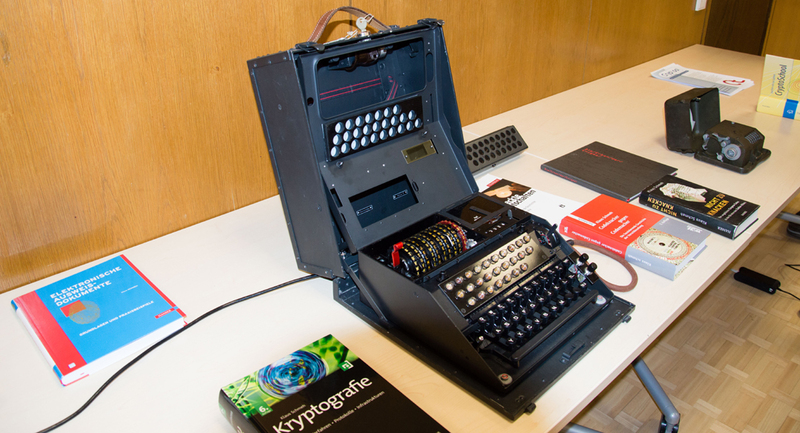 He is one of the world's leading experts on historical ciphers. His books "Nicht zu knacken" (the ten biggest unsolved mysteries of encryption) and "Codeknacker gegen Codemacher" (about the history of encryption technologies) are standard books. In his blog "Klausis Krypto Kulumne", he writes about his favorite topic. In his talk, he will give an overview about "encryption and crimes". He will present whether backdoors actually help law enforcement to catch bad people. The fourth speaker is Dr. Nicolas Courtois. He is author of more than 100 papers in cryptography. One of his specialties is cryptanalysis with particular attention paid to operational software algebraic attacks and focus on realistic attack scenarios with low quantities of data available to the attacker. He is author of numerous attacks on systems used by millions of people every day: MiFare Classic, stream cipher E0 in Bluetooth encryption, DES, AES, GOST, etc. For a very long time and until today, numerous ciphers have been built from compositions of permutations. 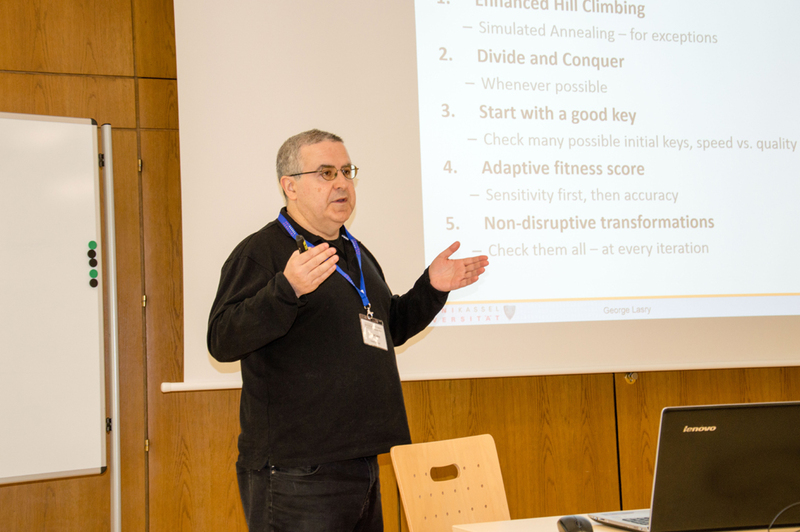 In his talk, he will survey some basic principles of cryptanalysis in this setting: concepts of SAT/UNSAT immunity, fixed-point attacks, slide attacks, involution attacks, cycle structure attacks, permutation factoring, amplification, reflections etc. These principles and methods have been with us since 1920s, and we still see them on a regular basis in cipher cryptanalysis. Prof. Dr. Arno Wacker opens the event. George Lasry during his talk. 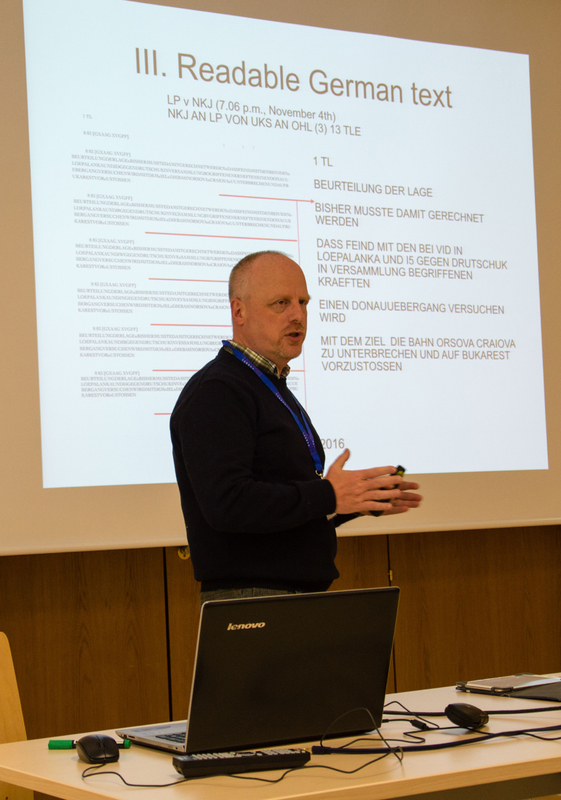 Dr. Ingo Niebel during his talk. Dr. Ingo Niebel during his talk. 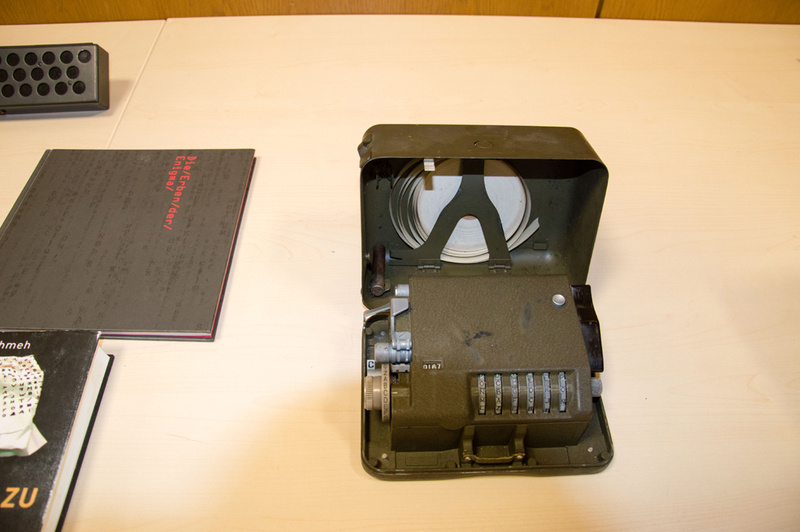 The M-209 cipher machine. 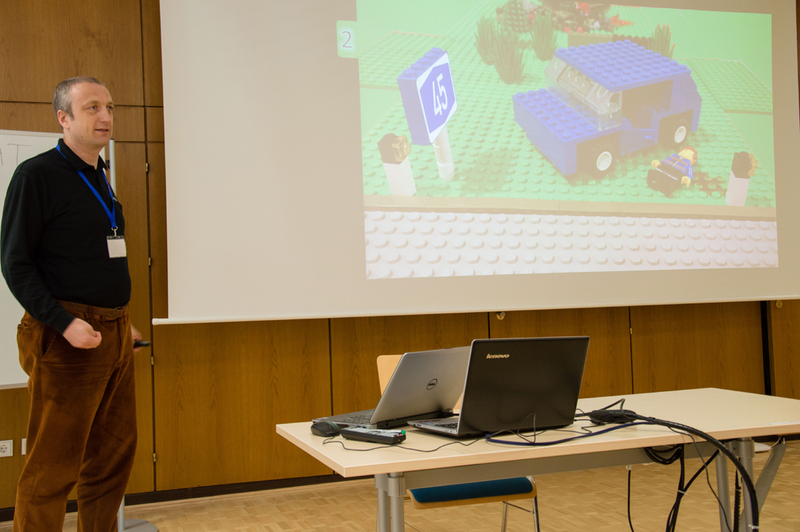 Prof. Dr. Joachim von zur Gathen showed it to the interested audience. A NEMA machine. 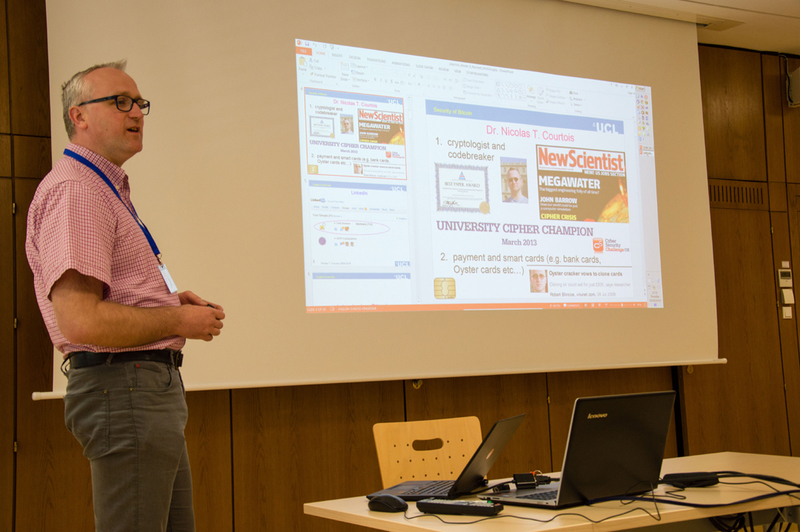 Klaus Schmeh showed it to the interested audience. 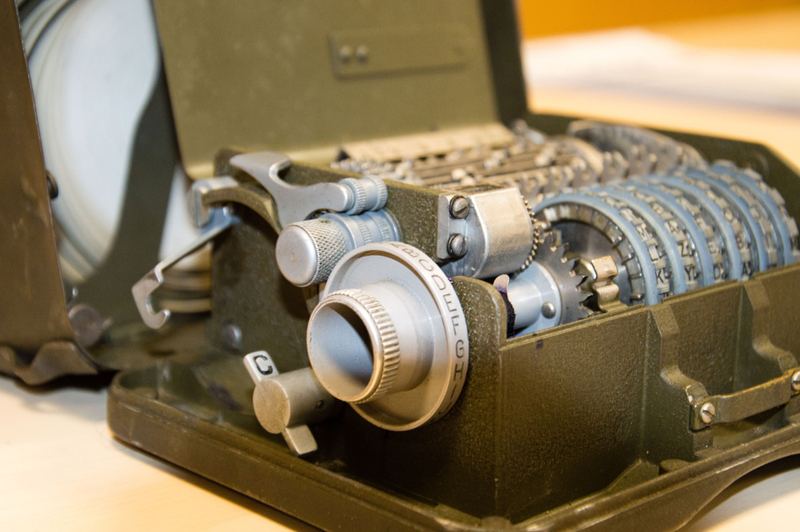 The M-209 cipher machine of Prof. Dr. Joachim von zur Gathen in close-up. Prof. Dr. Joachim von zur Gathen opens the 2nd session of the day. Klaus Schmeh during his talk. Dr. Nicolas Curtois during his talk. Nils Kopal during his talk. The HCC 2016 audience.